A common cause of neck and arm pain is a cervical disc herniation or foraminal stenosis. As the nerves to the arms leave the spinal cord and travel out, they must pass through tunnels made up of bones, ligaments, and discs. With disc herniations or bone spurs, these tunnels can narrow and a nerve may become pinched leading to pain, sensory loss, and even weakness. Fortunately, these types of problems usually respond to conservative care, but sometimes surgery is needed and the good news is that there may be a minimally invasive option. Traditionally, pinched nerves in the neck were treated with open posterior approaches, which lead to major muscle disruption and pain post-operatively. Anterior discectomies and fusions have become extremely popular because they avoid the excessive muscle disruption of the open posterior approach, but one is left with a spinal fusion. Recent advancements in minimally invasive spinal surgery have allowed us to treat selected cervical nerve impingements with very small incisions, less post-operative pain and muscle disruption, and quicker return to work and normal activities. Minimally invasive posterior cervical foraminotomy is made possible by a tubular retractor. 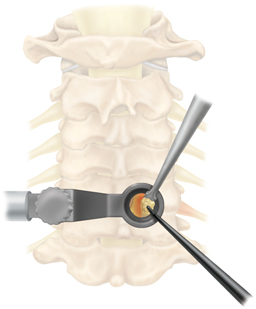 Through a thumb-sized incision and a muscle-splitting (as opposed to muscle-cutting) approach, a small tube can be placed to give the surgeon access to the spine. Under a microscope or endoscope, the surgeon can then make a small window in the bone and expose the pinched nerve. The disc herniation or bone spur may then be removed, thus freeing the pinched nerve. The tube is removed and a couple of stitches are placed to close the incision. This surgery is typically performed in under one hour and most patients go home the same day and return to work within a week or two. Not every spine surgeon is trained to perform this surgery, so make sure to seek out all of your options. I recently traveled to China at the invitation of the Beijing Neurosurgical Institute to give a lecture on this surgical technique, and it was very well received. 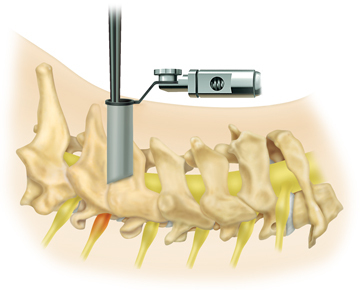 Minimally invasive surgical options are truly changing the way we care for our spine patients!